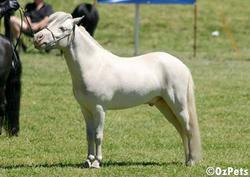 Miniature ponies, also known as Fallabellas were originally bred by the Fallabella family in South America. They MUST stand under 34 inches or 7 hh and are the smallest horse in the world. They are quiet, friendly and very intelligent. Occasionally you may find a temperamental horse. Miniature ponies, because they're so short and fat are prone to founder, it is best to minimise their intake of fresh lush green grass. Being small they are not suitable for riding, but do need plenty of exercise as they can tend to become lazy. They come in just about every colour. 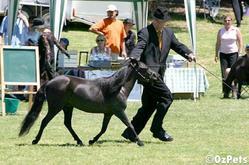 You may see them in harness however their purpose is purely as a pet and they are bred throughout the world.